The Photo Kathmandu team is working round the clock to ensure that you experience the most of Kathmandu while you are here in town for the festival. 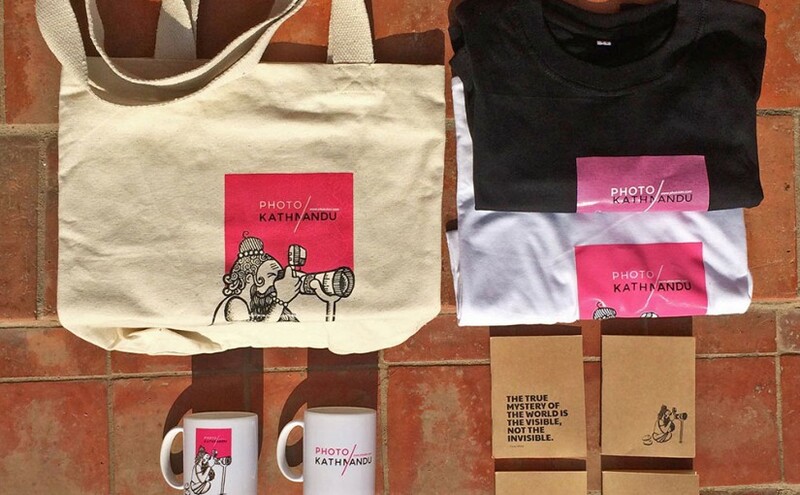 And while you are here, you will not want to leave without some of our cool, cool merchandise, especially designed for Photo Kathmandu by local artists. We have also partnered with one of Kathmandu’s hippest artists, Shraddha Shrestha aka Deadline, whose wild, funky illustrations adorn our merch. Notebooks from Bhav: Bhav Products is a local stationery house that produces notebooks, planners, stickers and postcards with a distinctly Nepali flair. We have teamed up with Bhav to produce blank or grid notebooks in four different designs. There are notebooks with quotes about photography and notebooks with illustrations—a special sadhu by Shraddha and a cool camera by Bhav. Camera Strap from RS Chala: If you want to stand out in the crowd during the festival and afterwards, you might want to sport our distinctive leather camera straps, handmade by RS Chala. RS Chala is a subsidiary of RS MOTO, a custom motorcycle company that also designs and produces handmade leather products. Tote Bags from Project Chhap: Everyone loves a tote bag, especially one with a distinctive illustration that recalls the analog days of cassette tapes and manual cameras. These tote bags are designed by Project Chhap, a collective of artists and designers who share a passion for urban Nepali culture and the arts. T-shirts, badges and mugs from Fuzion Art and Designs: Photo Kathmandu will be featured on a variety of t-shirts and badges that you can sport and mugs that you can drink out of. There will be three designs for badges and two designs for mugs while t-shirts come in two different colors, white and black. Initially started as a design house, Fuzion now focuses on products like the ones they’ve produced for Photo Kathmandu. All merchandise will be available for sale at our info points in Swotha and Yala Maya Kendra during the festival. So don’t forget to pick up some memorabilia for yourself and for those back home when you are here for Photo Kathmandu. You will be supporting the exhibition and local artists. Just one more reason to get even more excited about Nepal’s first photography festival.